The photos were taken by a youth who toured the area with some friends. He described the situation in which the photos were taken in a letter submitted to a U.S. agency specializing in these cases. 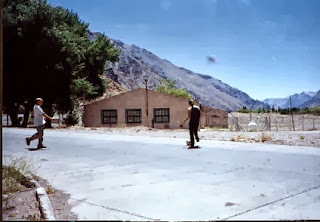 Julio Razquin, a young man who was on tour with some friends, managed to capture an image in which a strange object can be seen in the air. Razquin published a letter with details on the situation, addressed to a specialized UFO website in the United States. Razquin was on a tour of the Andean Range with some British friends when they decided to stop at a truck weigh station in the locality of Punta de Vaca. They got out of their vehicle to rest a little and play soccer. At that time, the young man says he took two photographs at that location, with a difference of one minute between one and the other. Nothing appears in the first one, but the object can be seen in the second. "The weather was perfect, without a single cloud in the sky. Nothing was present at the time the photo was taken," he stated in his letter. He added that his grandfather was a renowned astronomer and meteorologist in Argentina, and he was therefore knowledgeable about these phenomena, not hesitating to state that it was a UFO. Razquin also provided details on what could be seen in the photo. "Note a white horizontal line that can be seen on and over the object, interrupted by the mountains. Another detail is a thin "wake" over the object. Neither of these details was visually in evidence at the moment." Finally, he stressed the importance of having the photos disseminated to dispel any doubts about them. “I am allowing this photograph to be exhibited with the purpose of inviting competent and reliable people to contact me, and therefore answering any questions about its physical presence and its nature," concluded Razquin.